I bought some very inexpensive chisels from a Harbor Freight. I think they are the ones in the link below. For me it was the smaller the better. I mainly use straight ones but sometimes the scoop one. I a friend of mine made a smaller chisel that is about a 1/16th of an inch wide. Its become one of my favorite detail chisels. I forgot answer the sanding question. I have a sanding block that works great. I've never tried dowels but that sounds interesting. If you try it let us know how it works out. Another thing I've found that works well is an electronic tooth brush. Cut the bristles off and glue sandpaper on the end. It becomes a mini electric sander. Other wise just sand paper in my hand works too. To make your own small chisels cheaply, get a box of masonry nails, they come in different sizes as well, and using cut off disks and grinding wheels in a small power tool, shape and sharpen the ends as required, then sharpen on a hone. (safety specs on ). Use some dowel as a handle. These keep an edge as they are high carbon steel. Hacksaw blades can make good edges as long as they are the good old fashioned type made from high carbon steel that fractures when bent (4 times around a large parade ground at the double for breaking one during fitting training soon taught RN apprentices to use a hacksaw properly), not one of the modern flexible ones that only have hardened teeth. I also use used 'x-acto' type blades epoxied into dowel, and resharpened and shaped as required. See photos. This one is made from a masonry nail and is about 2 mm. In fairness, I inherited a couple from my dad who carved animals from wood. However, I shamelessly copied his ideas on the newer ones. I like the small handles - I find it gives me more control than the xacto type handles on small items. 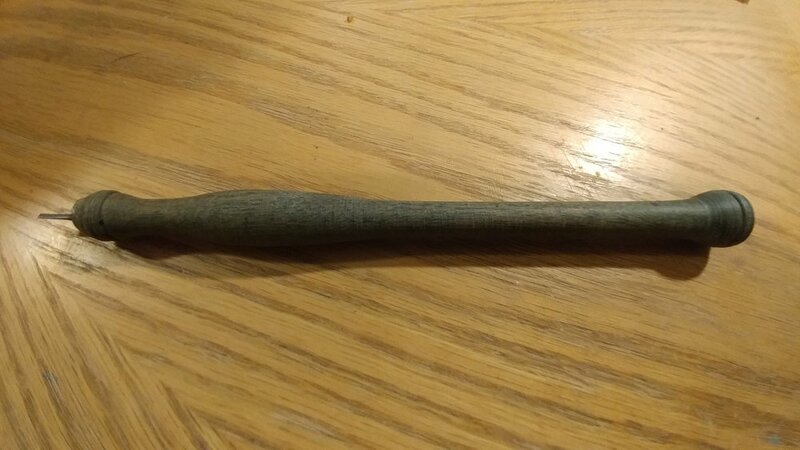 Speaking of handles, this is the chisel a friend of mine made. He turned a caligraphy style handle for it. It has some great balance and control to it. I tried calligraphy a few years back and I have some pens lying around I also turn pens and wine bottle stoppers so I have pen blanks laying around they should be just about the right size for handles, and what's nice about them they come in dozens of different woods from exotic to all the hardwoods you can think of. That's a nice looking chisel, I'm trying to hone my building skills so I started a 1:75 scale Bluenose ii schooner I have the hull just about done and ready for the rigging , I realized my building skills have suffered over the last ten years and I thought that doing something a bit bigger would let me do that, but I also have a SIB project going also I have the bottle and an trying to figure what to put in it I think something square rigged because I've never done a square rigged ship before so the chisels are a project in between those two. How the hand eye coordination, arthritis in the hands, and eye sight have changed from 58 yrs. to 68 years. I just picked up those chisels at a craft store that Dsiemens posted. Last time I chiseled, I used a jack knife and a flat top screwdriver. doh!